Run Potato Run! 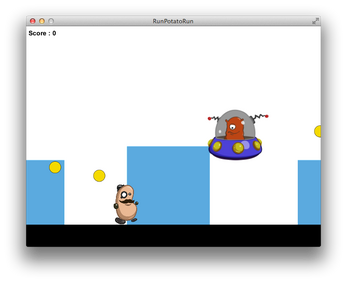 - My first game in Unity. App created by Liam Chessell using the 2D Platformer Asset Bundle. In Run Potato Run!, you control bean man who has just realised he is actually a potato! You control him using the Up, Down, Left and Right arrows through an endless runner in an attempt to escape his alien captors. It may also help to collect some money along the way! Get as high a score as you can before the aliens get you! The game is played as a stand alone app. Download the file to play the game!